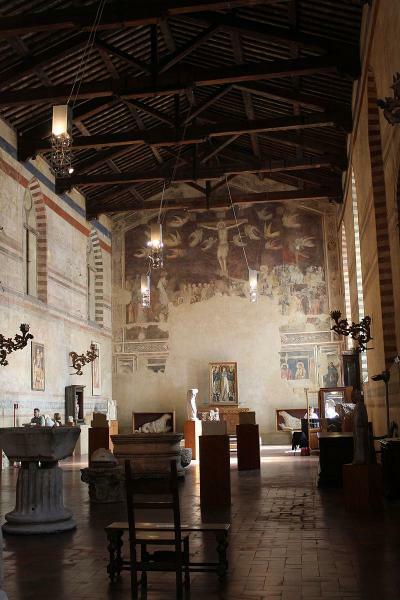 This foundation, with its many pieces donated by art collector Salvatore Romano (1875-1955) is housed in the refectory of the long gone 14th-century convent of Santo Spirito, are the scanty remains of a Last Supper below a well-preserved, highly dramatic Crucifixion by Andrea Orcagna, in which Christ is seen alone against an enormous dark sky, with humanity ranged below and angels like white swallows swirling around in a cosmic whirlwind. Romano's interesting collection of Romanesque odds and ends fill the rest of the space, including 13th-century stone sea lions from Naples, and fragments of reliefs by Donatello, an angel by Tino di Camaino and a Madonna attributed to great Sienese Jacopo della Quercia or his circle. Adm €7, €5 ages 18-25, under 18 free. Joint ticket with the Cappella Brancacci. Open to only 30 people at a time.